Quiltville's Quips & Snips!! : March ‘19 Quilty Box Gift-Away! There are some NEW great things happening with Quilty Box! Quilty Box is not only working with the industry’s top designers, but has also teamed up with Paper Pieces to bring you FULL paper packs, acrylic templates and fabric in their NEW Quilty Box, Paper Pieces edition! More info on that below! I still have photos to share from Mountain Quiltfest, but as March will be GONE by the time I get back from Louisiana (I’m flying out in a couple of hours, oh boy!) I am sliding this on in here. Are you ready for something really YUMMY and two chances to win?? The March box is full of Springtime goodness! A fat quarter pack of Walkabout by Sheri & Chelsea and Moda! Your Nest Organizer – This thing is fabulous and I’ve wanted one! Walkabout Flower Boxes Table Runner pattern. The Paper Pieces Quilty Box! This box contains NEARLY everything you need including the paper pieces, the charm pack of Walkabout focus fabric, acrylic templates, and thread to make the Walkabout Stars quilt with complete instructions in the Bundles of Inspiration Magazine. I LOVE THIS LITTLE QUILT! It finishes at approximately 23’’ x 23’’. The pattern suggests using solids for the “alternate” diamonds in the stars, but I think I would even scrappy it up a bit further and add some of my own stripes, dots, plaids and other prints from my own scrap stash here to give it less of a “one fabric line” look. Perhaps a wider variety of scrappy neutrals for the white required as background? With only 16 stars in the quilt, this would be a great “Sit on the porch” project at Quiltville Inn! Would you like to win the Paper Pieces Quilty Box? We are going to draw for TWO winners. One will receive the Quilty Box Basic, the other the Quilty Box Paper Pieces version and I will draw for the winner Monday, April 1st upon my return home from the Gulf States Quilting Association Event in Louisiana. It's been a quick less-than-24-hours home. I spent my afternoon, evening and up to bed time doing this! Those of you who placed orders while I was in Tennessee – half of the 80+ orders hit the post office yesterday by closing time. The rest will be dropped off this morning on my way to the airport. Thank you all so very much! Emmy Lou has been missing her Mama! I guess when you are a 19 year old cat, you can give the airplane ears and stink-eye look as much as you want! I’ll be home on Sunday, baby girl – it won’t be too long! EVERYTHING is in full regalia! The trees don’t look as pretty pink as they are. The sky is gray and there is rain in the forecast. How boring life would be if it all went the way we planned it. 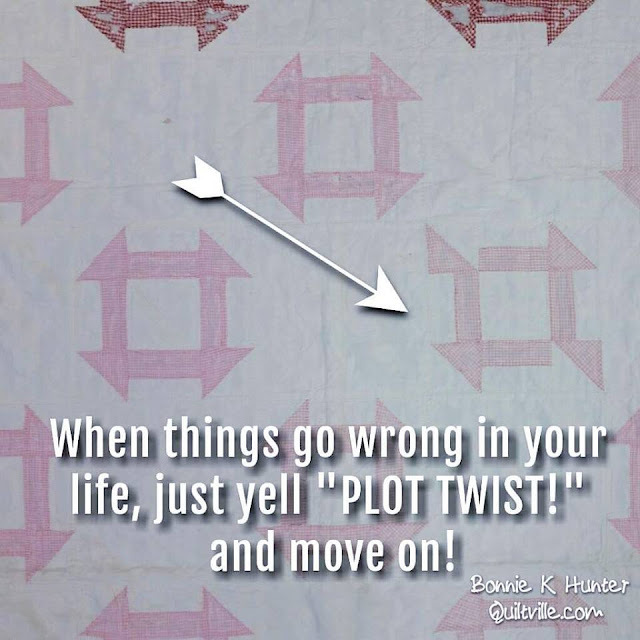 I am grateful for the plot twists and bumps in my road that have brought me to where I am now. Side note: I can't help but giggle at this block and wonder what happened to cause it! But then, what if we made ALL of the blocks this way - would it create a secondary design that made this quilt better than the original idea? And off to New Orleans I go! A first comment by me? As you quilt up a slew. Well anyway, thanks for your teaching and example of patience. I'm imagining that you share so much of yourself, of who you are that people have begun to take liberties, telling you the 'shoulds' and 'shouldn'ts' in a misbegotten attempt to be helpful... although the problem children, isn't there always one? in EVERY class? I really don't want to be that ONE! It came as a huge surprise to me that you might have more than one, AND that people would be so cheeky as to make demands. sigh... I knew from the git-go I wouldn't be able to attend Quiltville Inn, because I am unable to do stairs; however, I am enjoying every step you post on your journey and tho i'm getting a bit irritated at people and their sense of entitlement... i wouldn't know if you hadn't told us, just how outlandish people can be... thanks for sharing that big bunch of nonsense, maybe doing so can help you 'vent' it all... I think Emmy Lou is telling you to stay home and keep those "boy cats" out of her way! More snuggles and cuddles... please. Cats in Carlsbad CA Thank you for being you. Have a blast in Slidell, and enjoy some yummy foods. Don't worry Emmy Lou will forgive you for leaving so quickly, though I'm sure she will make you pay a "cat" penalty. lol You and she will both deserve some much deserved lap time upon your return. We should all be so lucky to age as well as Miss Emmy Lou! Love the new title: might make a cute new quilt all by itself. I Like your comment about Emmy Lou and her Air Plane ears! My Missy gives me the "Owl Look" every so often- Ears straight up, the owl face and turns her head like an owl. I will swear, she has been an owl in another life! Where the sun is shining and we are to have a Sun Filled week! Spring is trying to happen! perfect quote for the quilt. Safe travels. Great cat shots. Think that Churn Dash quilt would have been cute for that design to alternate. Safe trip. All those animals will forgive you and be so happy to see you again. So much about this post made me smile! Love the quilty box goodies. So adore Emmy Lou's face. My black cat does the same thing but I love how you named the look...airplane ears and stink eye. If you don't mind, I might borrow your description the next time Tallie looks at me that way. AND that wonky quilt block is to die for. It makes me chuckle!!! Have a great trip and thank you for brightening my day! Cats just crack me up. People who say that cats don't care that they are so independent have never had a cat. They let you know when they are not happy with you. 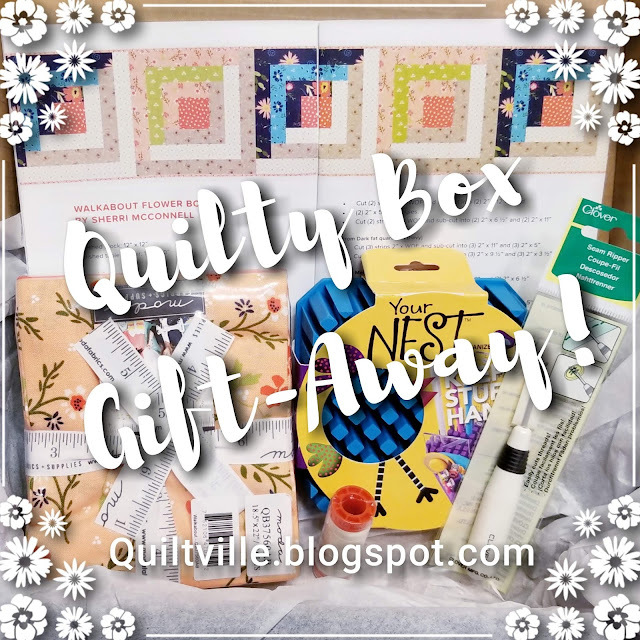 Love the Quilty Box this month. Hope I win. Oh boy, EmmyLou is giving you "the look". Safe travels! Glad you knew about the stink eye! What a fun Blog... I will continue to follow you Bonnie. Safe travels wherever and however you go! Have a fabulous trip and I’m sure Emmy-Lou will forgive you when you get home. Cats are such funny creatures they like things just the way they like them lol. Love the look of this moths quilty boxes the fabric looks so pretty. cats don't have owners they have staff!! Funny! I just love having my morning tea while reading the adventures of Bonnie Hunter! I wonder if this quilt used the “only God is perfect mentality”, had to be on purpose to a point no? Too have both corners askew..haha..many thanks for the morning wake-up! My two boys never give me the stink eye. Why? Because I give it to them first, when they disappoint me. And then they go running when they see it directed towards them. Oh-oh, Mom's pissed off at me for something she knows I DID! Gotta stay out of her way! Shake my finger at them, give them the stink eye, and off they go. Bonnie, your quote on today's blog was so appropo, today. I know you don't follow politics and what's going on in the geo-political world, but I do. Things happened today (yesterday, in reality) that became a HUGE plot twist in the story of what's going on in our nation, and the world... and has left many scratching their heads. And that's how I'm going to take it... as a 'plot twist' that will reveal itself in due time. Thanks for reminding us that that is what exactly happens and how we should take it! Oh Emmy Lou, I love you even with your Stink Eye! Thanks for the Quilty Box give away. So many fun and useful things in this month's box. Safe travels and can't wait to hear about all the fun you have at the classes you are teaching! As a cat lover, that stink eye hit my funny bone. I hope you are quickly forgiven. Look forward to seeing who wins the Quilty Box. I had a Siamese cat that would check on me, when I returned from a trip and then, ignore me for 2 or 3 nights!